When discussing the treatment of Indigenous People in the “Americas”, it is glaringly obvious that the U.S. government along with a large percentage of the population have a collective amnesia when it comes to the REAL history. We see political candidates speaking about race and only discussing black, white or Hispanic issues as if the Indigenous don’t exist. We see discussions of “reparations” for blacks due to slavery but any suggestion that the Indigenous are entitled to the same is met with silence. The fact of the matter is that going all the way back to 1493 the illegal “Doctrine of Discovery” was used to commit mass genocide not only in the Americas but elsewhere in the world as well. In this post I am going to share information that shows the U.S. government still has a program in place to not only deny Natives basic human rights but it is also involved in an ongoing program to destroy the people and their culture. As one of Native American descent on both, my mother and father’s sides, I am a bit perplexed that none of the mainstream talking heads NOR the government are addressing the atrocities that the U.S. committed against the Indigenous from the very beginning of this country beginning with how we were thought of by the “framers” of the Constitution. “Ordered that of the Indians and Half-breeds sentenced to be hanged by the military commission, composed of Colonel Crooks, Lt. Colonel Marshall, Captain Grant, Captain Bailey, and Lieutenant Olin, and lately sitting in Minnesota, you cause to be executed on Friday the nineteenth day of December, instant, the following names, to wit… “Text from President Lincoln to General Sibley ordering the execution of American Indians in Minnesota. Why the difference? They take down confederate flags and statues because they deem them offensive to blacks but the Indigenous aren’t given the same respect. Recently a town in New York voted to keep its racist seal as shown below. It was reported this morning that due to national exposure and pressure from multiple organizations including “The Daily Show” that they are now going to change it. A cursory glance is all that is needed to see it as racist. On a similar note the ongoing issue of the Washington Redskins mascot has still not been resolved. For most Indigenous the term is akin to the “N” word to African Americans. You can bet that would never be allowed as a mascot, yet again the Indigenous are not respected. Recently Congress passed a defense bill that had a hidden provision in it to sell off Apache Holy Land to foreign mining interests. How is this not seen by the global community as a violation of human rights? There is a long history of the government kidnapping children and putting them in “boarding schools”, cutting off their hair, making them learn European-Anglo culture and destroying their own. This hasn’t stopped either. In some states such as South Dakota the government is still forcibly removing children from their families. 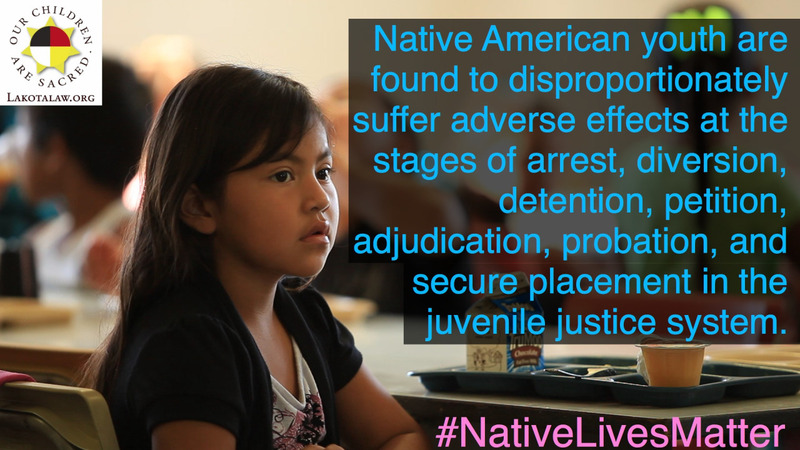 This environment is also exacerbating the prejudice against Native youth by the law enforcement and juvenile justice communities. If there is to be any kind of healing between races in this country the government’s atrocities against Indigenous People must be acknowledged and recognized. Lands that have been stolen and placed into Federal ownership should be returned to the Indigenous before Congress gives away the mineral rights to more Native Lands. The UN has recently called for an inquiry into the “Doctrine of Discovery” which I feel could lead to a repudiation of the illegal document which will indict many “Colonizing” nations such as the U.S., Spain, France, and England along with The Vatican to make amends to those that they committed mass genocide against and robbed. This video clip below is a good representation of how the Indigenous were forced off of their lands by unscrupulous capitalists and land barons with the full support of the U.S. government. The federal land grabs, selling Native lands to foreign interests, allowing white supremacists to occupy federal land that was stolen from Paiutes as is happening in Oregon presently – all of this and more show that the U.S. government still considers Indigenous People to be second class citizens.